Watercolor on paper. 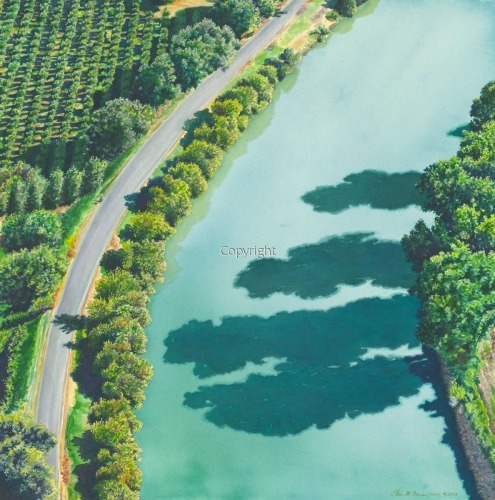 Aerial view of the Sacramento River near Clarksburg. 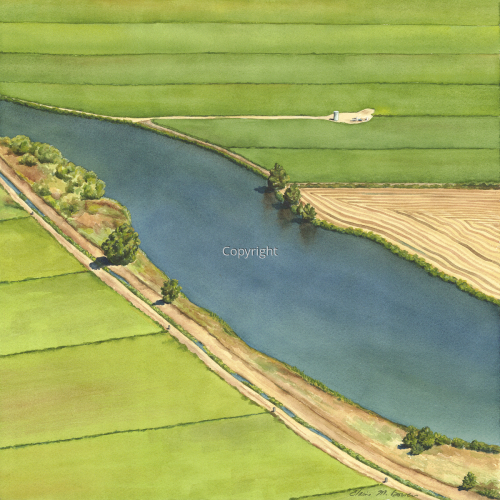 Shown in the American Watercolor Society 148th International Exhibition in NYC 2015. Watercolor on paper. 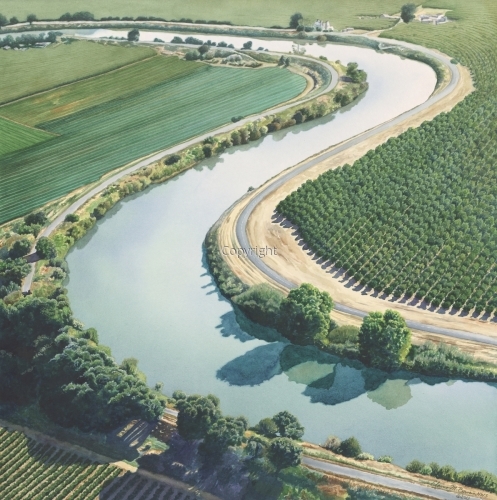 Aerial view of the Sacramento River near Clarksburg. This painting was in the Crocker Kingsley Competition 2015, juried by Gregory Kondos. 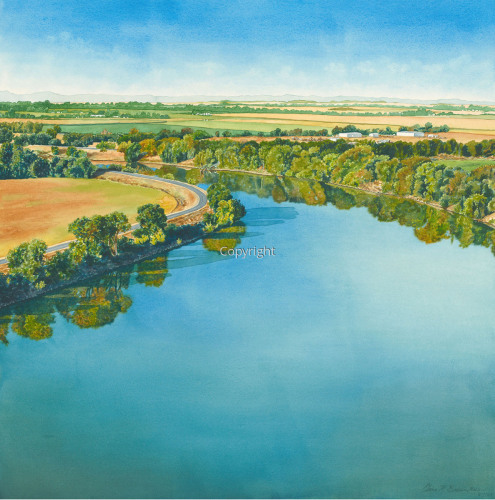 Watercolor on paper, aerial landscape painting of Sacramento River, California. 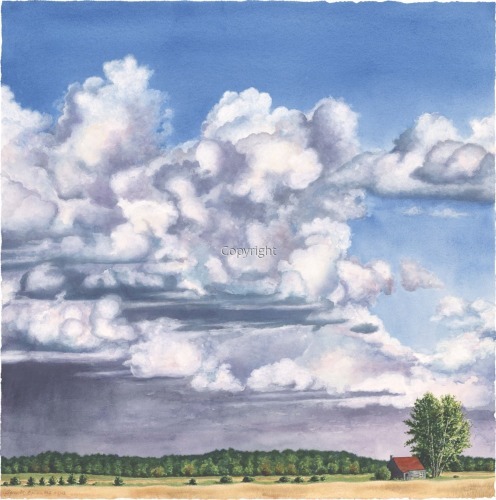 Awarded AWS Bronze Medal of Honor in the 146th American Watercolor Society Annual International Exhibition, 2013. Image was painted from a photo taken while flying in a 1940's Piper Cub. 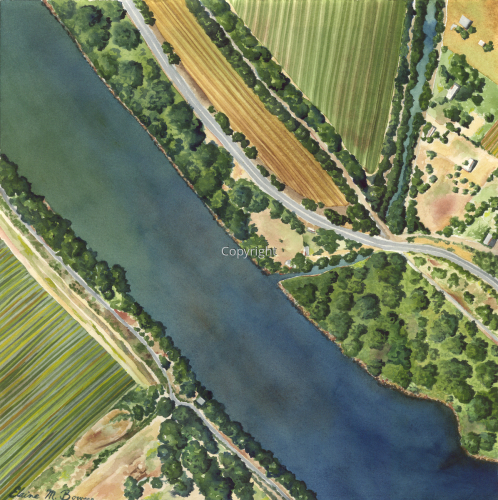 Watercolor on paper, Sacramento River near Clarksburg. Aerial view near Walnut Grove, CA. Note the red orange fields with the tomato trucks in the center. This view was during the tomato harvest. There are several tall radio towers which are local landmarks. 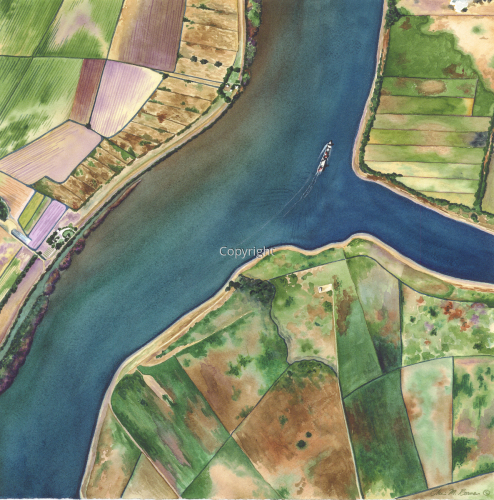 The Sacramento River is on the upper right. If you look carefully you can see the bridge and the locks. This was a commission done for a local rancher. 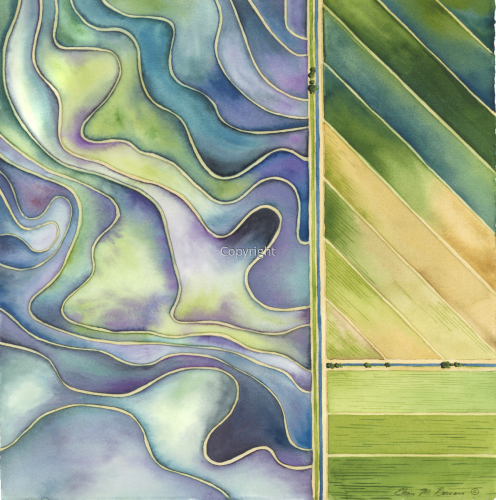 Watercolor on paper, aerial landscape painting, Sacramento, CA delta region. This painting was featured on the cover of "Inside the City" newspaper May 2009. Watercolor on paper. Aerial view of flooded rice fields near Sacramento, CA . The Sutter Buttes, noted as the smallest mountain range in the world, are in the background with clouds reflected in the flooded rice fields. The structures in the foreground are grain bins used for storing rice. 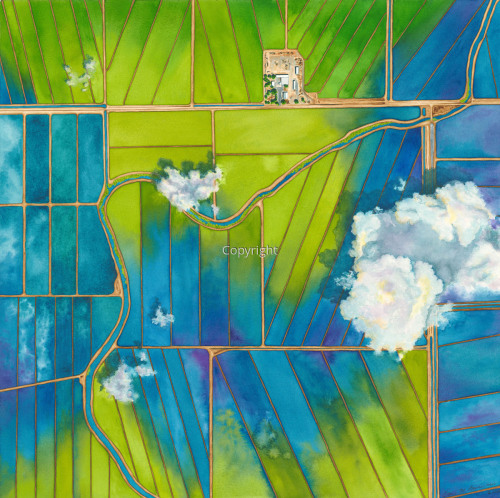 In this painting one can see the older contour rice fields and the newer laser leveled fields. Watercolor on paper. 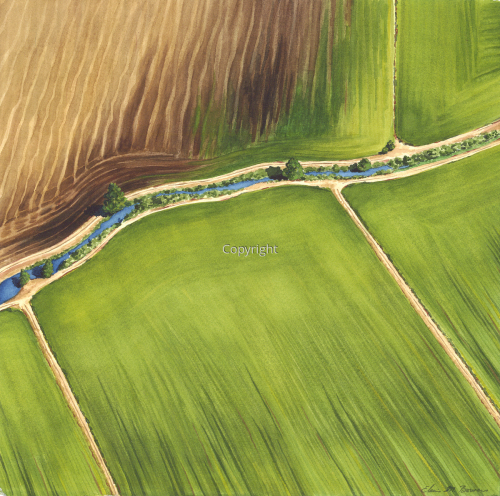 Aerial view of rice fields near Sacramento, CA . This painting was featured on the cover of "Inside the City" newspaper Sept. 2014. This painting will be in the American Women Artists Exhibit in Tuscon, Arizona at the Tuscon Desert Museum in Oct. - Nov. 2017. Check the "Upcoming Shows" page for more info. Watercolor on paper. 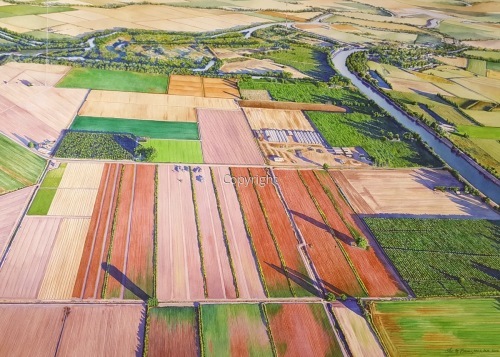 Aerial view of farmlands near Sacramento, CA. Note the car visible on the road. 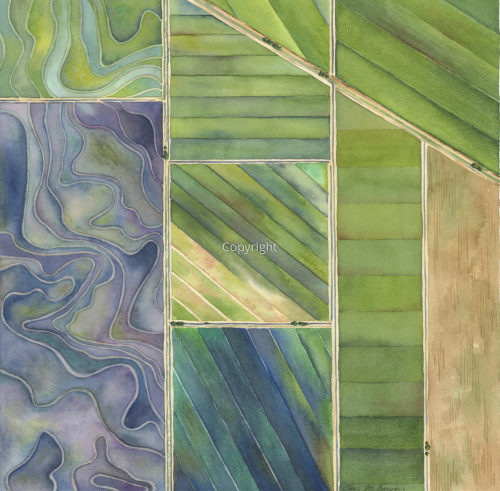 Watercolor on paper, aerial landscape painting of farmlands near Sacramento, California. Watercolor on paper. 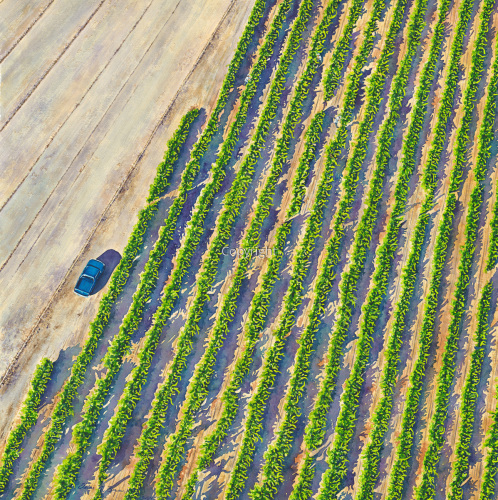 Aerial view of vineyards, near Sacramento, CA. Note the three workers in the vineyards at the top. 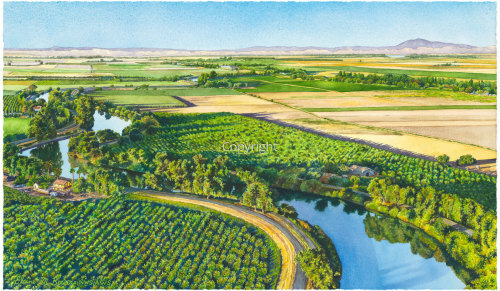 Watercolor on paper, aerial landscape painting of Bogle Winery vineyards at Colby Ranch, in Clarksburg, California, near Sacramento. 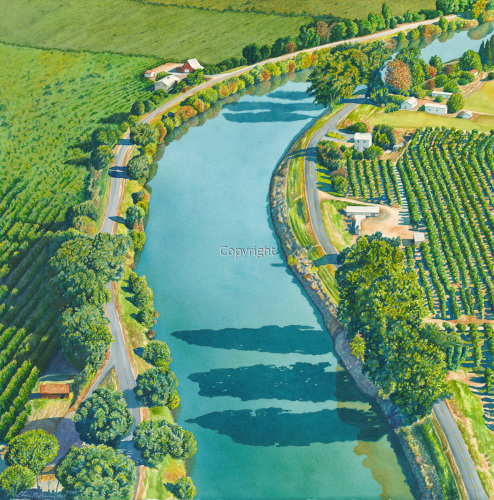 Watercolor on paper, aerial landscape painting of Bogle Vineyards in Clarksburg, California, near Sacramento. 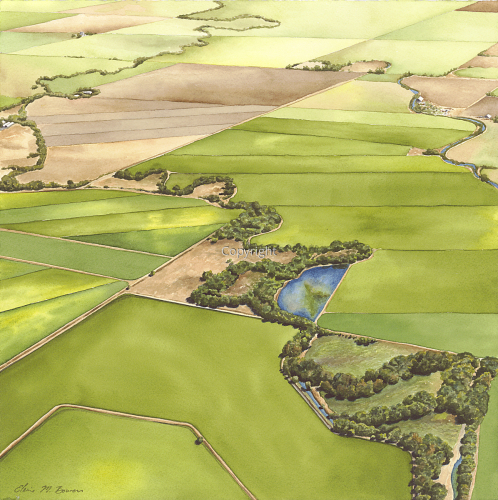 Accepted into the National Watercolor Society 91st Annual International Exhibition, 2011. 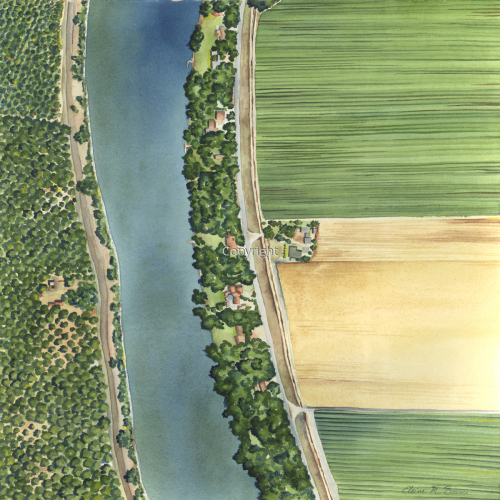 Watercolor on paper, aerial landscape painting of Sacramento, California farmlands and riparian vista. 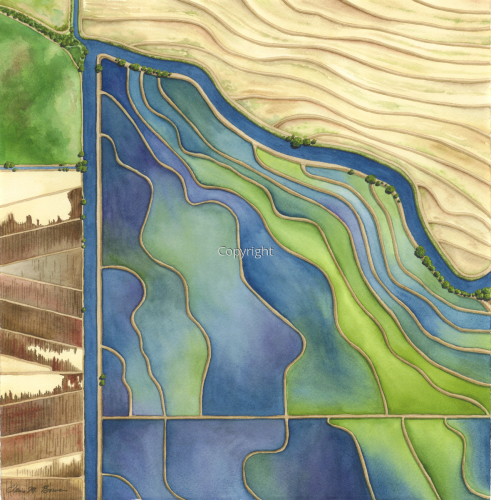 Aerial view of the Sacramento, CA rice fields with topographical levees. 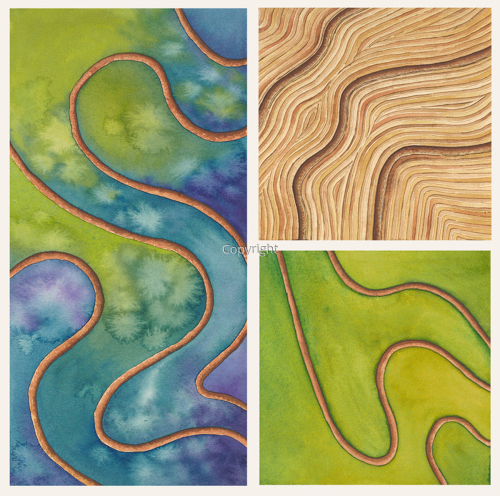 The undulating contours are formed when the land is leveled so that the fields may be evenly flooded. This method of farming rice is changing due to laser leveling methods, which allow fields to be more easily flooded and has better harvests. 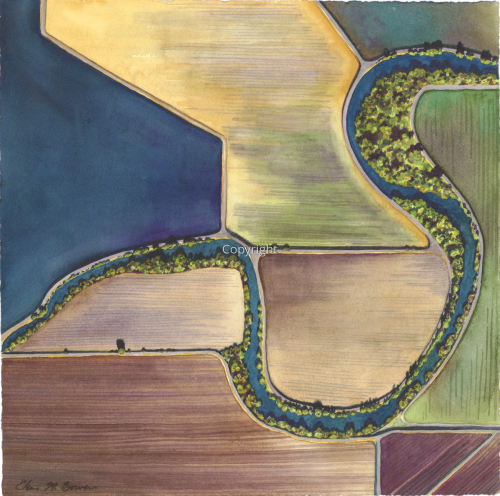 The levees are straight and parallel in the newer farming methods. Watercolor on paper. 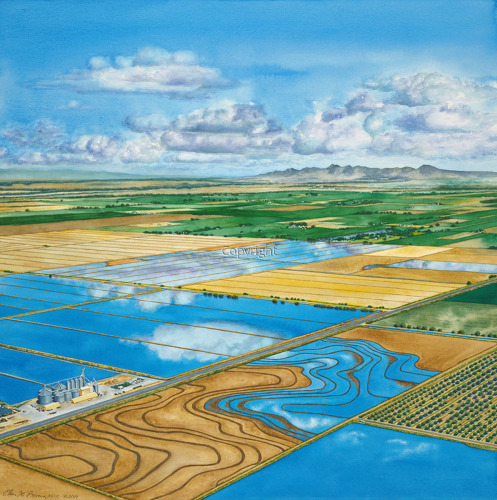 Aerial view of the Sacramento farmlands showing a variety of agricultural fields, specifically rice fields in various stages. The work is suggestive of a quilt and is made of several small images on separate paper, then float mounted. This montage painting is one of eight in a subseries. 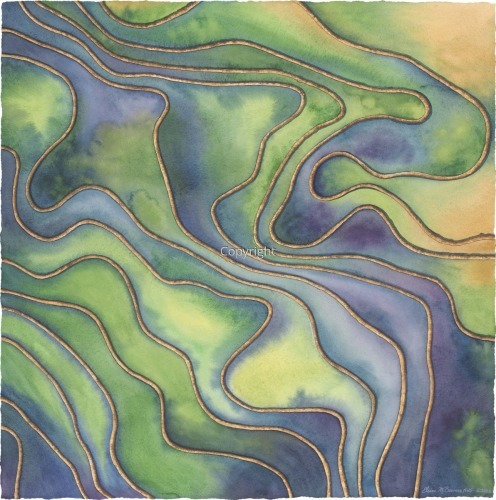 Six of the pieces in the series are available for purchase and are similar to this image. Click on the seperate images to see a few more in the series. You may inquire to see additional images. Watercolor on paper. 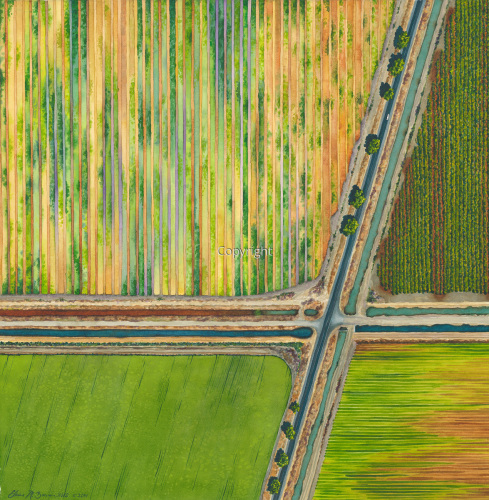 Aerial view of rice fields near Sacramento, CA . 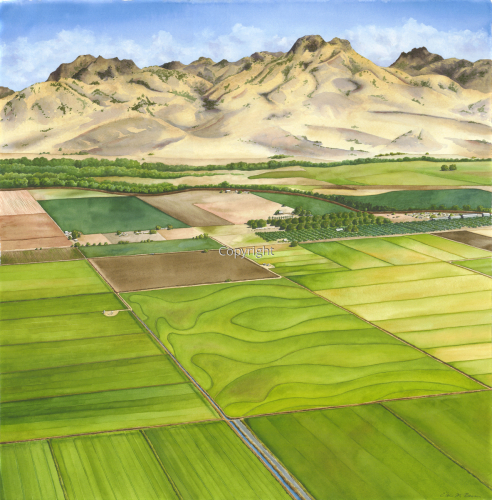 Watercolor on paper, aerial landscape painting of the Sutter Buttes, Northern California, near Sacramento; known as the smallest mountain range in the world and a local landmark. 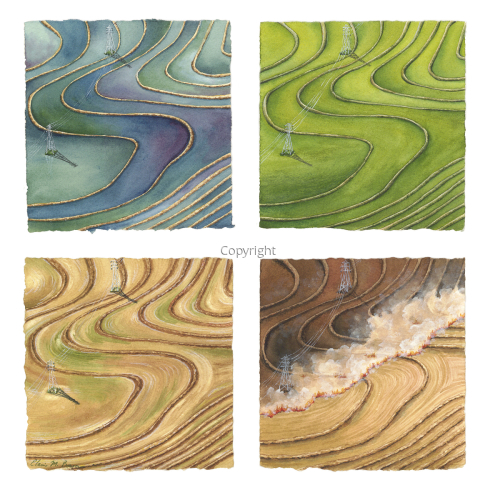 Watercolor on paper, aerial landscape painting depicting identical agricultural scenes of rice fields in all four growing seasons. The final stage is burning of the rice fields, has been now been discontinued. Sky view of the Saskatchewan prairies focused on the ever changing cloud formations. The area is known as the "Land of the living skies." Watercolor on paper. 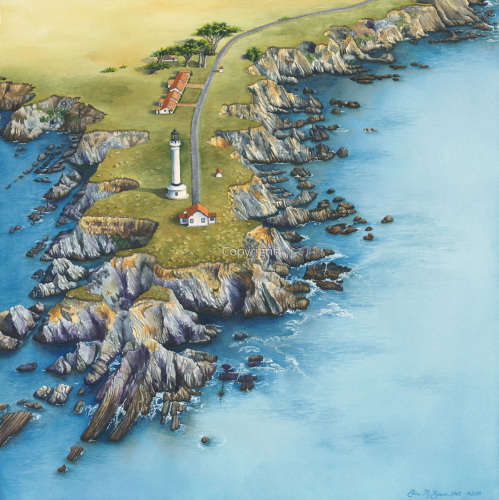 Aerial view of Point Arena Lighthouse in northern CA. The remains of the Devil's Punch Bowl can be seen in the foreground. This area has recently been designated as part of the newest National Monument known as Point Arena-Stornetta National Monument. It is near the Manchester, Irish Beach area. Watercolor on paper. 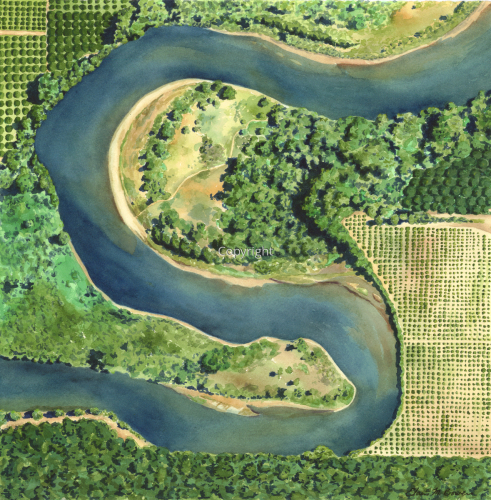 This is an aerial view of the Sacramento River & Delta. The building in the middle left is the historical Grand Isle Mansion. Many events are held there, including weddings. The location is just North of Walnut Grove in Northern California. 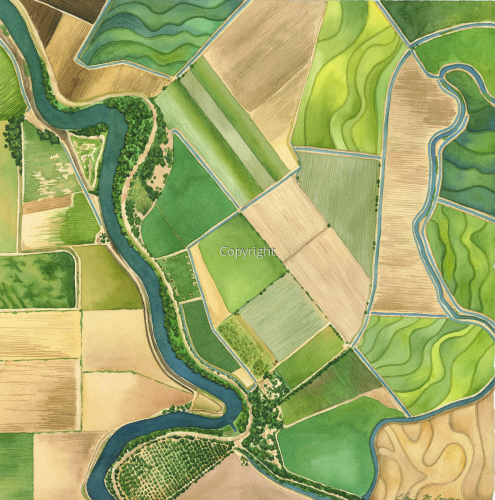 Watercolor aerial view of Sacramento River Delta near Clarksburg and Walnut Grove, California. 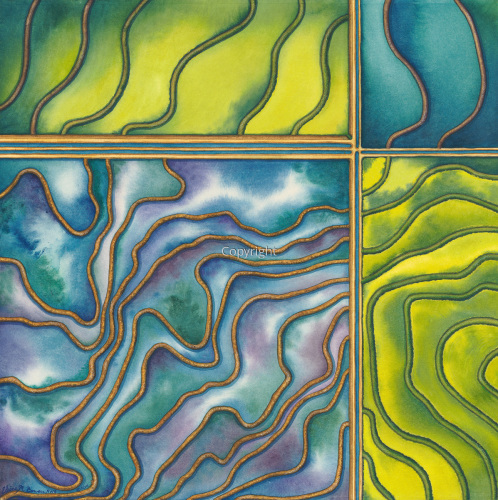 This painting was in The Delta Forever exhibit at CSUS library gallery 2016. Aerial view Sacramento River Delta. Watercolor on paper. 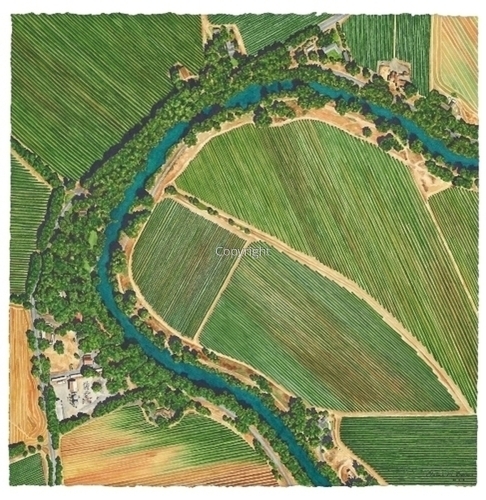 Aerial view of the Sacramento River delta area, near Walnut Grove. This painting is one of a subseries. Watercolor on paper. 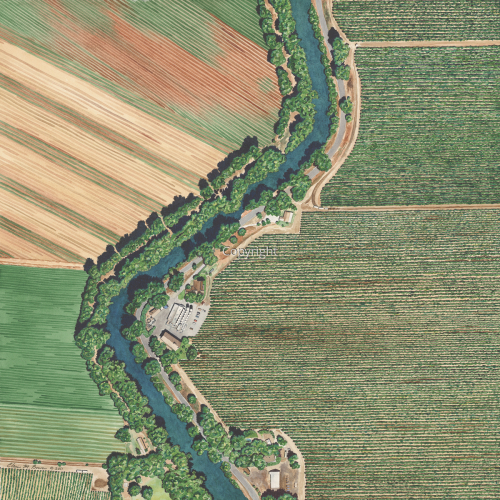 Aerial view of the Sacramento River delta area. 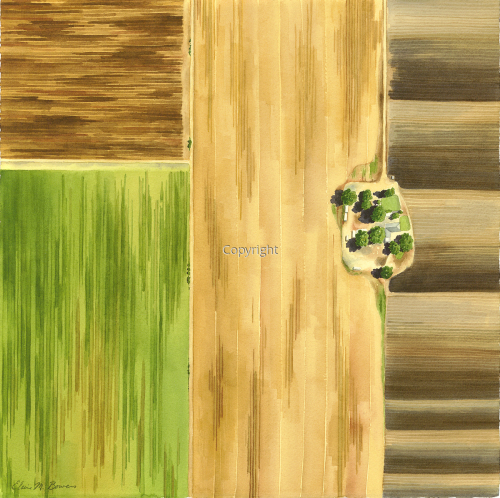 This painting is one of a subseries.